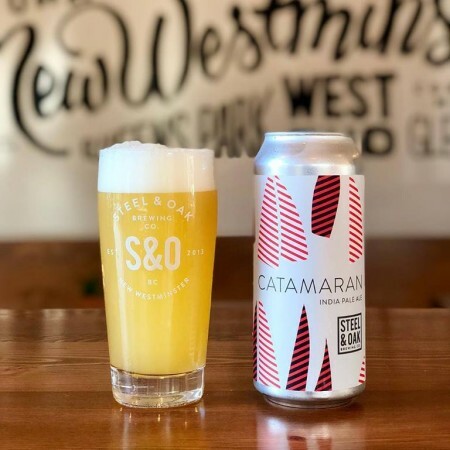 NEW WESTMINSTER, BC – Steel & Oak Brewing has announced the release of the latest in its rotational series of IPAs. Catamaran is brewed with pilsner, wheat, and flaked oat. It’s been dry hopped heavily with Azacca and a touch of Amarillo for sunny boat-like notes of tropical fruit, citrus and those neat Hawaiian flowers they put around your neck when you stay at a fancy hotel. It’s hazy, juicy, and finishes with a gentle bitterness. Catamaran is available now on tap and in 4-packs of 473 ml cans at Steel & Oak, with distribution to local liquor stores to follow next week.